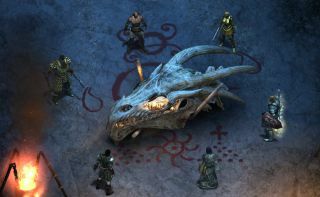 The first part of the Pillars of Eternity: The White March expansion went live today, and of course that means it's time for a proper launch trailer. Just as interesting, though, are the many changes made to the game by the 2.0 update, which Obsidian detailed on Steam. The expansion adds a number of new areas to explore, "largely focused on the snowy environments inspired by Icewind Dale," with a new quest hub, quests and dungeons. The level cap has been increased, allowing your party members to climb to level 14 (the previous limit was level 12), and they may also now wield Soulbound weapons that grow more powerful over time and take on different characteristics depending on the class they're bound to. There are also two new companions who can join your party, a rogue and a monk, who can travel with you back to the base game once the White March fun is over. On the more under-the-hood side of the coin, multi-class talents are now available, and Pillars now supports party AI and enhanced enemy AI. It will also now be possible to re-spec party members at any inn or tavern. "It gives flexibility for the player to experiment with the RPG systems and try out builds with the newly added multi-class talents," Obsidian said. "If you aren't completely satisfied with your character, you can now do a rebuild and start over fresh." I'm excited about the release of update because it means I can finally get on with playing Pillars of Eternity: The expansion was announced just a day or two after I installed the game, and with so many improvements promised in 2.0, I didn't see much point in sinking my time into 1-point-anything. Pillars of Eternity: The White March Part One is available now on Steam and GOG.